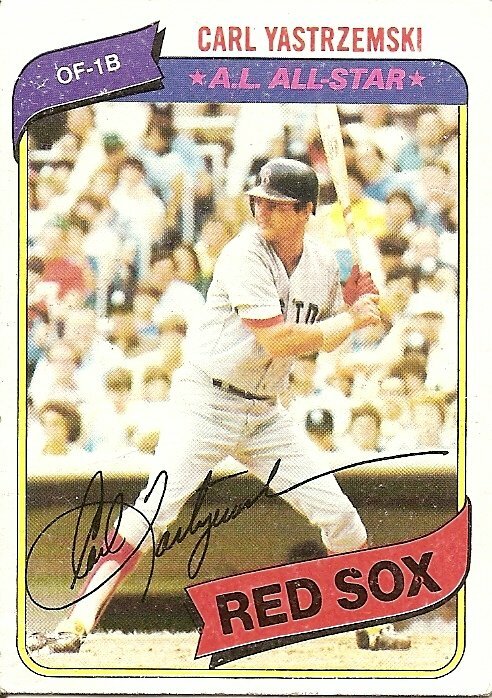 Back in June, I told the story of how my childhood wish for an autograph from my hero, Carl Yastrzemski, was finally fulfilled by way of a circuitous combination of some long ago promotional endorsement of encased meats and the kindness of a Boston Globe reader, Ann Beaudoin, who’d seen a story in that paper about me and my gods that mentioned my unrequited desire for the Hall of Famer’s scribbled name. Yesterday I got another piece of mail from Ann with a newspaper flier inside and a message relating that she had seen the photo on the cover of the flier and decided to pass it along. Sometimes I wonder about things. I wonder a lot, obviously, about the past. I suppose all this wondering is a way of asking if the past and present can ever meet. I don’t know if they can. But now, at least, I know that there is a place “where the past and present meat” and that they do so in the very spot where Yaz once stood. I also wonder about the future. I wonder what happens when we die. Will there really be a question and answer session when the final out is recorded? This is a common story we like to tell ourselves anyway. Maybe it’s true. And what did you do with your one brief life? I’ll be asked. I’m not really sure, I’ll reply. Come on, give me something, the intake worker will prod me. It’s on my list, and we can’t leave it blank. We had a whole meeting about it. Well, I guess there’s this, I’ll say. 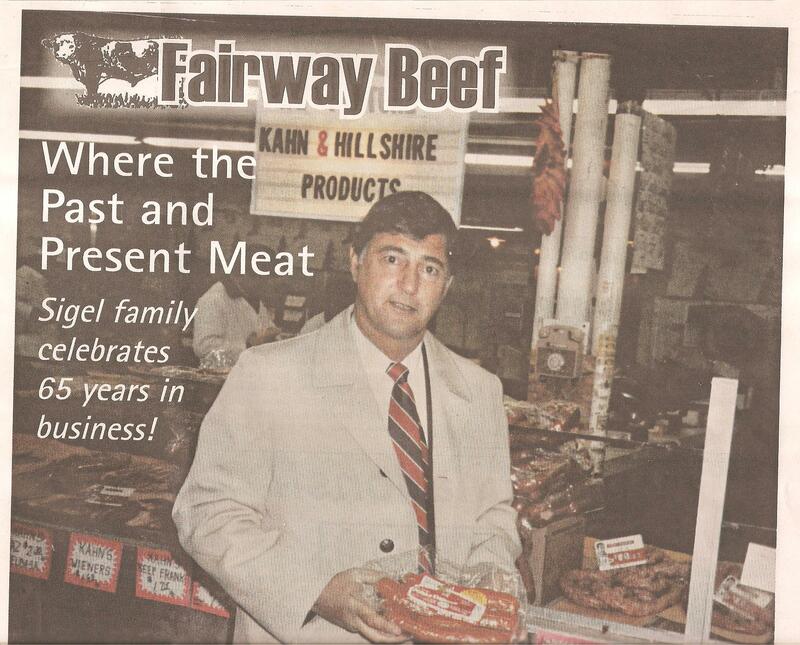 I don’t know if it says anything about what I chose to focus on in my life, but there was one time when someone I’d never met saw Carl Yastrzemski holding kielbasa and thought of me. Whether or not this tidbit gets me processed to some higher plain or to a more purgatorial or even punitive realm or, worst of all, to nonexistence altogether, remains to be seen (or not seen), but in this world it made the past and the present and the future meat and I couldn’t help but smile. I’ll be part of a reading at a bar in Chicago this Sunday. Hope to see you there. If you can’t make it and are suspicious that my ability to read is a hoax, I’ll leave you today with some grainy, Zapruder-ambiguous proof in the form of a bit of digital-camera video taken by my Uncle Bob at a reading I did this summer at the general store where, long ago, I first made the acquaintance of most of the gods who live in a shoebox on top of the file cabinet next to my desk. Here is the baseball card I love the most. It’s pretty beat up. I handled it a lot as a kid, then as an adult had it taped to the wall by my writing desk for many years. That’s how you’ve got to do it, I told myself, looking at the card. Dig in. Stay balanced. Wait. Hang in there. Wait. Be quick when the right pitch comes. The statistics on the back of the card provided further instruction. The tiny type, the many seasons, the stunning number of hits, the even more stunning number, hidden but revealed by simple subtraction, of outs. You’ve got to work at it for years. You’ve got to fail thousands of times. You’ve got to keep getting back in there, each time as awake and alive as you were your very first time. I must have looked at the card thousands of times. I don’t know if any of it rubbed off on me. Eventually I put it back in with the rest of my cards, but then four years ago I made a wall-hanging by bordering a copy of the front page of the October 28, 2004, Boston Globe with the holiest of my Cardboard Gods, the Red Sox players from my childhood in the 1970s, and this card found a place in the upper left hand corner. It was a crude piece of craft-making, the kind of thing a little boy would do. But I guess I wanted to hold on to the feeling of late October 2004 a little longer, the feeling of being a little boy again. 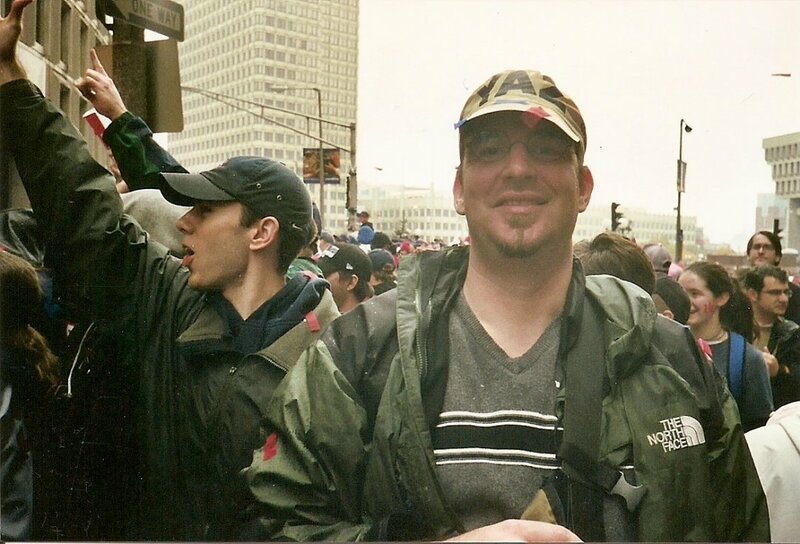 By October 2004 I had moved to Chicago. My decade or so of trying to cling to boyhood and hide from adulthood by sharing an apartment with my brother had come to an end a few years earlier, those first years apart painful for me, as if below the surface entangled roots were being torn. 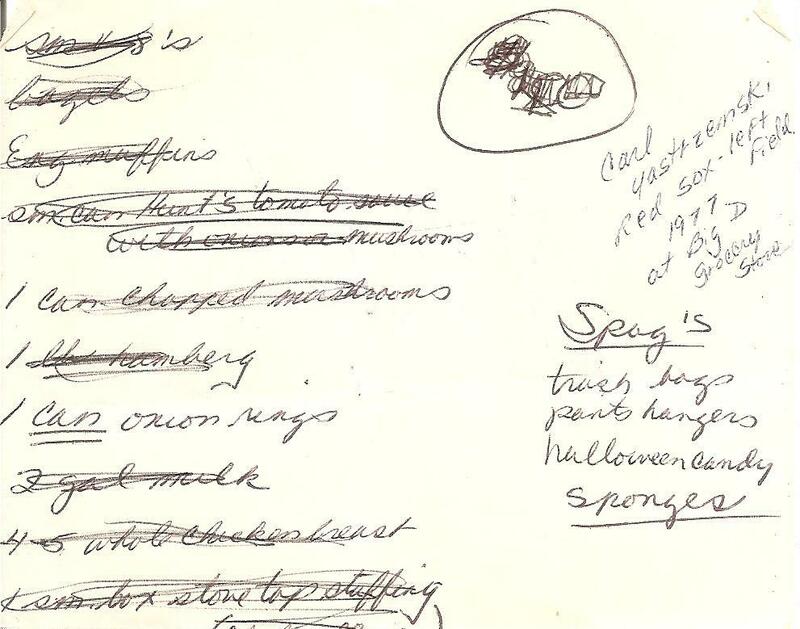 Our stuff had been mixed together for years. Now some of my stuff was missing, and other stuff that I did have made me feel guilty to have it, because it wasn’t mine. I’m reaching for metaphors here, but there actually were some real objects involved. I ended up with some of my brother’s novels; he ended up with some of my comic books. I ended up with an autograph made out to the both of us from cartoonist Daniel Clowes; he ended up with an autograph made out to the both of us from Steve Balboni. But of all the things I ended up with that weren’t mine, the one that made me feel the guiltiest was perhaps the one that had cost the least. 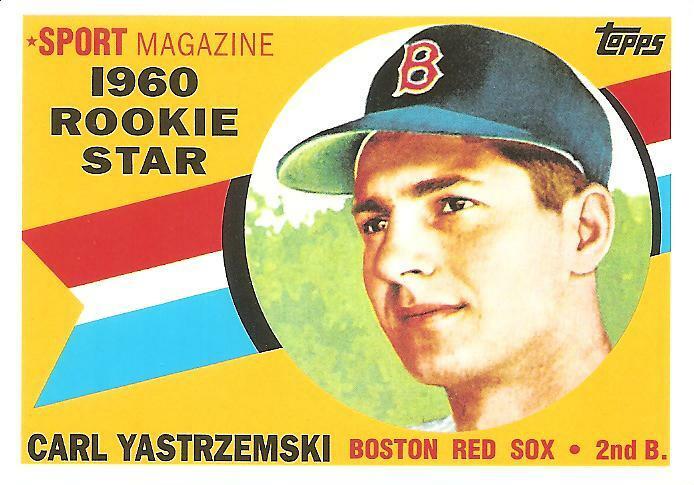 I’d been with my brother when he’d bought it, at a souvenir store outside Fenway a couple years after Yaz retired, a closeout item, the price slashed: a white painter’s cap with the word Yaz on the front and various career achievements listed on the sides. Somehow over the years of living together in New York I’d appropriated the cap (the cap is mentioned elsewhere on this site in a description of a grisly fight-filled Opening Day at Yankee Stadium), and it had been among my things when I’d moved off on my own. A couple years after the dud peyote in Truckee I moved in with my brother, who was living in a tiny railroad apartment on 2nd Avenue and 9th Street in Manhattan. I’d just finished my aimless post-college trip around Europe and I needed money. I got a job as a UPS driver’s helper for the holidays, then when the holidays ended I switched to loading trucks at the UPS warehouse on 10th Avenue and 42nd Street. My shift started in the middle of the night, but for some reason instead of taking the 3rd Avenue bus uptown from 9th Street and then transferring to the crosstown 42nd Street bus I walked the whole way. I set out at around 2 in the morning. Nothing ever happened to me on all but one of the nights, even though for most of the way I walked out of earshot and sight of any witnesses. But one night I got hit by a car. The driver had been blazing up 3rd avenue and made a left-hand turn onto the west-bound street I was crossing. He hit the brakes, but I still got scooped up onto the hood and then tossed back down onto the street. The guy got out, his eyes wide. I struggled quickly to my feet. The two of us stood there, staring at each other. I banged up my knee pretty bad and ripped my jeans and the elbow of my shirt, but nothing was broken. I walked the rest of the way to work and punched in and worked my shift, my knee hurting more and more as the shift went on. My job was to grab packages coming down a long groaning conveyer belt and sort them into one of four trucks parked behind me. Four other guys also worked the conveyer belt, each with four trucks to load. Five guys facing us worked a second conveyer belt. A cheap boombox played Everybody Dance Now over and over. The guy to my right shadow-boxed during the occasional lulls in packages coming down the line. The guy to my left had an African name and made an anti-Israel comment one night. I was the only white loader, but the supervisor was a harried white guy with a receding hairline and a mustache. He wore a tie and white short-sleeve button-down shirt and was always in a rush. It was tiring, monotonous work. The boxes turned my hands black and all my clothes gray. During the daily 10-minute break, I sat in one of my trucks and read Dante, hell then purgatory then paradise as the months went by. At quitting time I walked home down the west side and cut across 29th Street past towering early morning prostitutes, spent condoms strewn all over the sidewalk like kelp left behind by the receding tide. Near home I yanked a newspaper out of the trash and read it back at the apartment while eating generic three-for-a-dollar mac and cheese and drinking cans of beer, the blinds shut against the morning light. One day near the end of my walk home from that job I stopped at a light and looked across 3rd Avenue and saw my brother standing there, staring back at me. He was on his way to work. He had a heavy duffel bag weighing him down. I had my newspaper from the garbage. We both started laughing. Why not? One minute you’re a kid and the next you’re chained all night long to a conveyor belt. 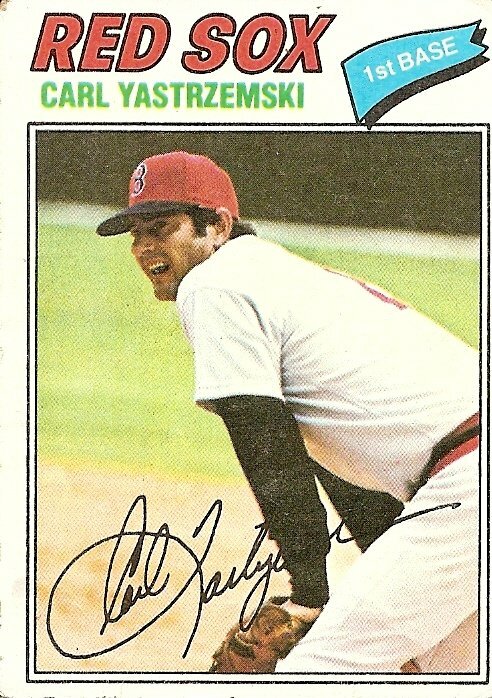 And your brother, your hero, is lugging a duffel bag full of undone work to an office job where his biggest thrill in many months has been finding and correcting a misspelling of the proper noun Yastrzemski. Sometimes you ain’t got nobody and you want somebody to love. 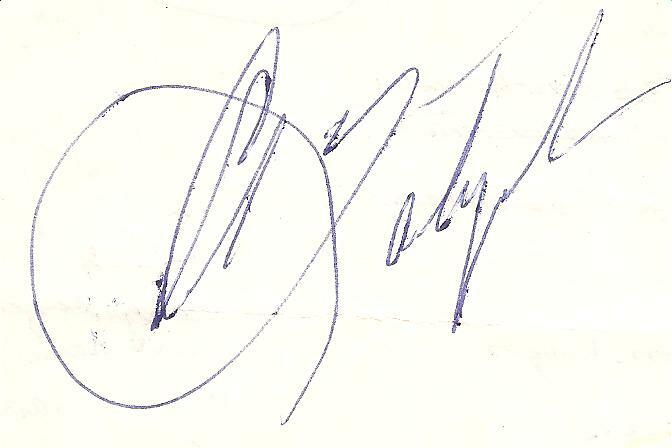 I’ve never asked God to show me a sign, but when I was a kid I wrote a letter to Yaz. “Dear Mr. Yastrzemski,” I wrote. I may have used this 1977 baseball card to get the spelling right. I told him the Red Sox were my favorite team and he was my favorite player, then I asked him for his autograph. I sealed and stamped the letter and took it out to our aluminum mailbox, flipping the red metal flag up to signal to the mailman that there was an outgoing letter. Later in the day, when I saw that the flag was back down, evidence that the mailman had made his daily visit in the four-wheel-drive Subaru required for rural Vermont postal delivery, I felt like gravity had loosened its hold just a little. My letter was on its way to Yaz! In a certain way my real life began that day, my life in the world. To that point I had never wanted anything beyond what was close at hand, beyond my family, my home. I began waiting for something more. Weeks went by, months, years. By 1987, a decade after I wrote the letter, I was still waiting, though the waiting had come to encompass more than a hope for a reply from Yaz. I don’t think I even thought much about Yaz anymore. 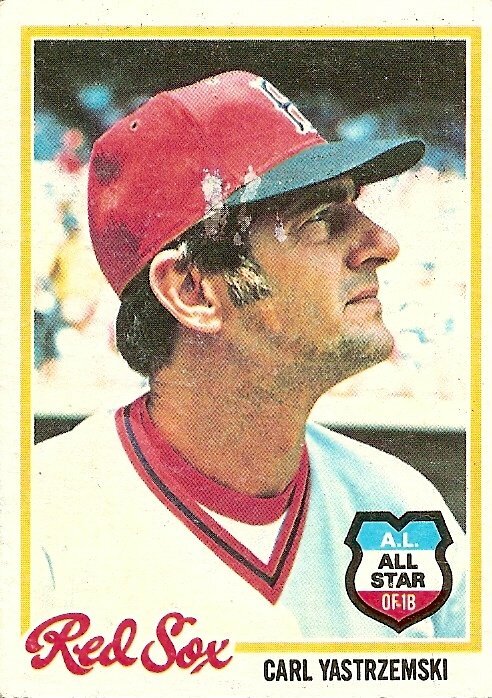 He had retired four years earlier after popping out in his last at-bat, that at-bat and its disappointing result an echo of the disappointing Yaz pop-outs that ended the 1978 one-game divisional playoff against the Yankees and the 1975 World Series against the Reds. 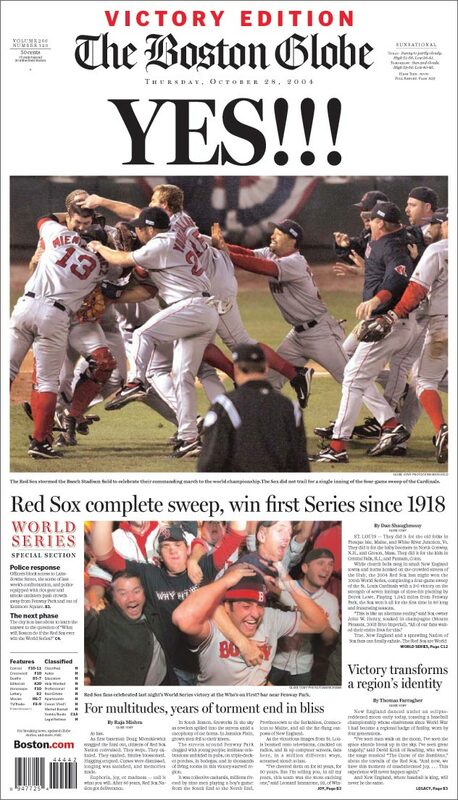 I spent the summer of 1987 in California, farther from the Red Sox than I’d ever been. My brother met me out there at the end of the summer, and the plan was that he and his friend Dave and I would drive all the way back east together. Actually, I had not yet learned how to drive and was hoping (and dreading) that I’d get a chance to practice as we Kerouacked ecstatically across the vast continent. I’d been in driver’s ed at boarding school in 1985, but I’d gotten expelled from the school before completing the course. I probably wouldn’t have passed the course anyway; I was an awful driver from the start, profoundly tense and unfocused, capable of provoking a beady-eyed expression of fear on my instructor’s face even when we were inching down remote dirt roads. 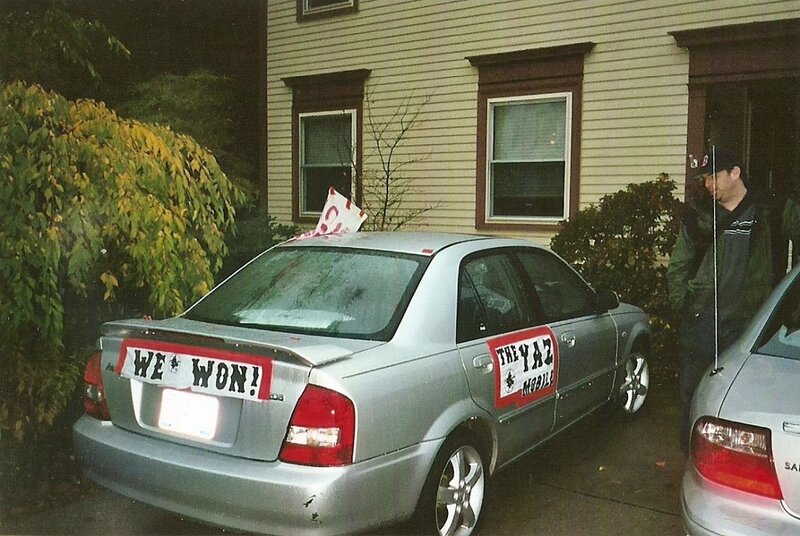 After the expulsion, I’d shied away from any chances to learn to drive. Though I was more comfortable being a passenger, and still am, I lived in fear that my inability to drive would turn out to be a tragic flaw, that I’d be called on to drive a guy having a massive coronary to the emergency room, and the last words he’d have to hear would be my apologies for never learning to drive a stick. I was hoping that somehow on the long drive across the country I’d free myself of all my limitations; somehow I’d no longer be myself, but someone better. The car was an Audi that my brother and Dave had arranged to drive east for a relocating businessman, and it broke down before we even got out of California, on a long uphill part of the highway just outside Truckee. We’d detoured to a Grateful Dead show the night before (obviously something not mentioned in the agreement signed by the businessman) and had during an acid trip bought three buds of peyote from some guy. I think we were probably hoping to try the peyote in a spectacular locale on our drive home, the Rocky Mountains, the Grand Canyon. Instead we ate them in a cramped hotel room in Truckee as we waited for the Audi to be repaired. They tasted so awful that we had to crush them up and shove them into ham sandwiches and wash each hideous bite down with several chugs from our stash of Budweiser tall boys. Once we finally choked them down we began to wait. During the acid trip the night before we’d passed the peyote buds around and agreed that they seemed to be pulsing and glowing in our palms. Now in the hotel room we thought about that glowing pulse, now presumably inside us, and we waited for the inevitable moment of liftoff. We waited to soar to other worlds. We’d find out the next day that the engine of the Audi was damaged beyond repair, causing us to abandon our cross-country drive and fly home. By then we’d have realized the peyote was bogus. But that night with the repulsive taste of it burning through the cheap beer on our tongues we sat in that hotel room and stared at one another, giggling, waiting to see the face of God. You are currently browsing the archives for the Carl Yastrzemski category.